Are you confident that you’ll pass your grade 5 theory exam? How about bagging yourself a merit or distinction? The pass mark for the ABRSM music theory exams is 66%. To get a merit you need 80%, and a distinction is awarded for a result of 90% or more. On this page you’ll find a list of some of the most common grade 5 facts that students tend to forget – take a look through and you might increase your score by quite a few points on the big day! 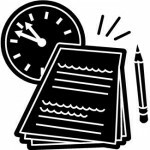 Don’t forget that over on the main website, MyMusicTheory.com has a completely free online course for grade 5 music theory candidates, covering the entire syllabus, including exercises and a practice test, plus lots of revision materials such as score-reading questions and quizzes. We also have a subscription only Revision Course, Video Courses, and marking services for past papers etc. Finally, why not subscribe to our new YouTube channel, featuring short, step-by-step tutorials on all the most important music theory topics! Free Sample Course: Grade 5 Music Theory ABRSM. Want to ace your grade 5 music theory? Join the MyMusicTheory video course for Grade 5 Theory candidates! 2. The time signatures 3/2 and 6/4 are NOT the same. Neither are 3/4 and 6/8. Although 3/2 and 6/4 have the same overall number of notes per bar, they are stressed (and therefore written) in a different way. 3/2 and 3/4 have three main beats per bar, but 6/4 and 6/8 have two main beats per bar. 3. The alto and tenor clefs are “C” clefs: they show you where MIDDLE C is, not “any old C”! 4. The pattern of key signatures is the same for each clef except the TENOR SHARPS. 5. A chord’s position (inversion: a, b or c) is determined by the BASS NOTE ONLY. Find the absolute lowest note on the stave (there may be more than one stave!) If the lowest note is the root, it’s an “a” chord. If the lowest note is the third of the triad, it’s a “b” chord (first inversion), if it’s the 5th of the triad, it’s a “c” chord (second inversion). For example, this chord is in first inversion (b). Write out the notes so that you make a triad – they should be stacked in thirds: A-C-Eb. Next, identify which note is the lowest – C.
This is the third of the triad, so it’s a first inversion chord. 6. All cadences end on either chord I or V.
You will usually have to write chords for two cadences. Each cadence will need two or three chords to complete the progression. 7. A 6-4 (Ic-Va) progression always has two IDENTICAL bass notes. If you have to find a Ic-Va progression, you need to look for two chords with the same bass note, then make sure they are chords I(c) and V(a). For example, the two lowest notes of the chord could both be C’s, but watch out – they could be an octave apart! In the key of C major, chord Ic has a G as the lowest note, and so does chord Va. If there is an upbeat (anacrusis/incomplete first bar) then the last bar needs to MAKE UP THE DIFFERENCE. Make sure the piece is exactly 8 BARS LONG in total. With an upbeat, you will have 7 complete bars, an incomplete bar at the start, and an incomplete bar at the end. Bar 1 is always the first complete bar. 9. Always end your composition on the TONIC. Look at the key signature and make sure you know what key you are writing in before you start. End the composition with a tonic note which falls on a strong beat. [See also “How to work out the key“]. Write a tempo word in Italian above the first note. Choose something “normal”! Moderato is always a safe choice. Also add a starting dynamic under the first note (or above it, for a vocal composition). Add slurs to quick notes (for instruments), and put them in the same way all through the piece. Follow the main beat if you are not sure of another plan! A tempo above the first note. A starting dynamic under the first note. Slurs over quick notes, broken across the main beats. 11. The only double reed instruments are the OBOE and BASSOON. You are tested on your knowledge of the standard orchestral instruments. The cor Anglais also uses a double reed, but is not a standard instrument. The clarinet uses a single reed (as does the saxophone, which is also not a standard orchestral instrument). The tenor voice uses either the bass clef (short score) or OCTAVE TREBLE CLEF (open score). 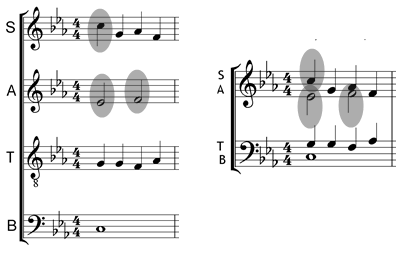 The little “8” under the treble clef (see the image left) means that MIDDLE C is the one high on the stave in a space – the note in the image is middle C! 13. When writing SATB parts, make sure the note STEMS are written the right way up. In open score (4 staves) the stems point up or down depending on their position on the stave. In a short score (on 2 staves) the stems point up or down depending on the part. The circled notes here show where the stems need to have their positions changed when you rewrite the music. 14. Transpose a key signature in the SAME WAY that you transpose a note. There is nothing special about transposing a key signature, but many candidates struggle with this task! Key signatures are transposed in the same way as notes. The original key is G major. Let’s say you have to transpose up a perfect 5th. The note a perfect 5th above G is D, so the new key signature is D major. It doesn’t matter whether the piece is major or minor, the result will be the same. If we assume this is actually E minor, then a 5th above E will produce B minor, which also has two sharps. 15. If in doubt, guess! You won’t lose any marks for trying! No questions are marked with a negative point system. Attempt every question and make sure you double check all your answers before you hand in your paper! In item 2 why not clarify the difference between 3/2 and 3/4 time signatures? They are not mixed up as often as these ones, because they have a different number of notes per bar overall. In 3/2 and 6/4 there are six crotchets (quarter notes) in both time signatures, so students often fail to see the difference. In 3/2 there are 6 crotchets but in 3/4 there are 3, so the difference is much easier to understand. Thanks for all the tips i soo nervous for my exam next week.im only 11!! !good luck to everyone who is doing the test this year! Thanks for the tips! Taking the exam tomorrow so this is really helpful. Good luck to the people taking it tomorrow as well! Thank. Tips a great help! Thanks for the tips, I’m taking the test this Saturday. Nervous…..
omg! im so nervous :/ but this helped a lot 🙂 thanks!!! Awesome thanks a lot, so relieved and relaxed. I got distinction on my grade 5 theory! Most of the questions I recognized from here. Thank you so much! Great tips thanks a lot I learned a lot God bless you. How do I tell the differnece between diminished and minor? I assume you’re asking about intervals, rather than chords. I’ve already watched it and I still don’t get it. My question was how to tell the difference between diminished and minor intervals. A diminished interval is one semitone smaller than a minor interval. E.g. C-Eb is a minor third, so C-Ebb or C#-Eb are both diminished 3rds. Another example: Bb-Ab is a minor 7th, so Bb-Abb is a diminished 7th and so is B natural to Ab. This is great! Taking my exam tomorrow and this helped a lot. Have my exam tday and this helped! This really helped a lot!